The option was there to just put this sucker into hibernation, but the thought of starting 2008 with this WIP still on the list made me feel deflated. So I just pulled it out again last weekend and decided to work on it a bit each day whether I liked it or not, and once I got going I realized how little I actually had left to do. The final block(s) – the bottom section with the 2 parallel squares – didn’t get quite as long as I wanted to, but the finished dimensions are actually quite close to the 60 x 50 inches of the size called for in the pattern, so that’s pretty decent. For finishing, I just did 2 rounds of single crochet. The pattern calls for a mitred garter stitch border – which would have been lovely and even and pretty – but the thought of picking up all those edge stitches again for a border made me want to cry, so I did the crochet thing instead. The thing with the log cab is that it’s extremely versatile, not too difficult, and you can customize it for whatever combination of colours you want. And it was a great fit for the selection of chunky Jamieson’s Shetland that I got on sale this past August, which had no more than 4 or 5 skeins in any single colour. 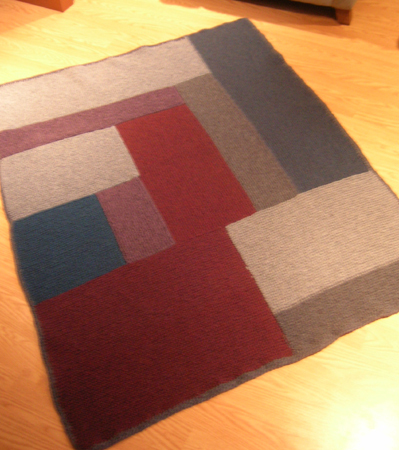 I realized what this blanket lacks in seaming, though, it makes up for in size. The cumulative nature of the blocks means that you can’t even consider making this a portable project, as you could if you were knitting a blanket in small blocks. But mostly – damn, y’all. That’s a lot of soul-sucking garter stitch. I’m glad i have this FO now and the yarn is gorgeous in this finished format, but I will never, ever, do a garter stitch blanket again. If I make any noises about another garter stitch blanket, somebody jump in and stick some sock yarn in my hand to distract me. And now I’m going to knit some socks. Well done!! It does look great so was worth the pain I am sure! Well, it looks great! But I’m with you on the soul-sucking garter stitch thing. I made a log cabin baby blanket with worsted weight cotton. My wrists were killing me and my brain was nearly mush by the time I finished. Never again!! ALL YOUR KORKNISSE ARE BELONG TO US. What an accomplishment! I know it was an incredibly large project, but wow! It looks phenomenal. I hope you’re super proud- I would be!! Love the blanket. I’ve been THIS close to starting one but I can’t bring myself to face that much garter stitch. Will you knit me one? Well, that turned out nicely. You win the award for endurance knitting. I could never do it! It’s beautiful! And huge congrats on finishing a blanket. That’s something I know I could never do! So many congratulations on pushing on through on this. Admirable willpower! Love the Korknisse – hope your harvest this year is a good one!